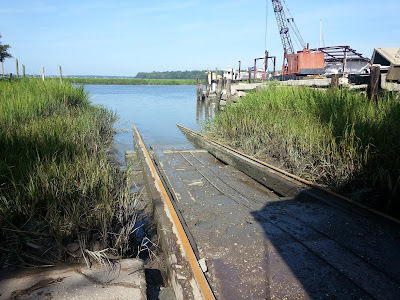 Sasser's Marine Railway on Wilmington Island across from Thunderbolt. On the outskirts of Savannah, GA.
We sat up in the wheelhouse talking for hours the night before, waiting out a thunderstorm, wondering what it would feel like in this storm if we were on the water instead of the rails and, more importantly, wondering how I would climb back down this 30’ ladder with my fear of heights. I seriously thought we’d have to invent another way down. 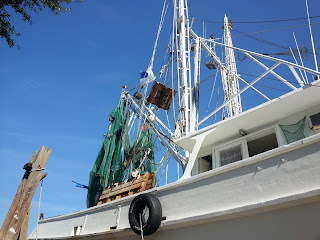 The commercial shrimp boat is an enchanted thing. When I see these old trawlers, especially the wooden ones, I feel like I have stepped back in history, maybe even into a fairy tale. The tall outriggers at the ready. The beautiful nets waving in the breeze, the old wooden doors, parched, cracked and two toned. 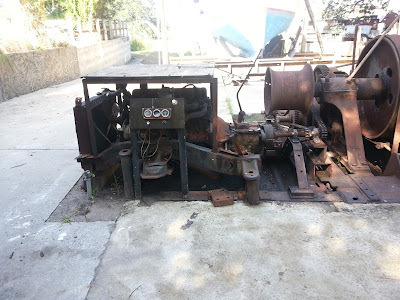 Even the tug-boat shape thrills me. I stare at the boat and dream tall tales of pirates and perfect storms and stowaways. My imagination goes full out. I have to be pulled away or I would stay there all day. But then, something else caught my attention. The rails! Marine Railways -- who knew?! I love old things like this and had to learn more. 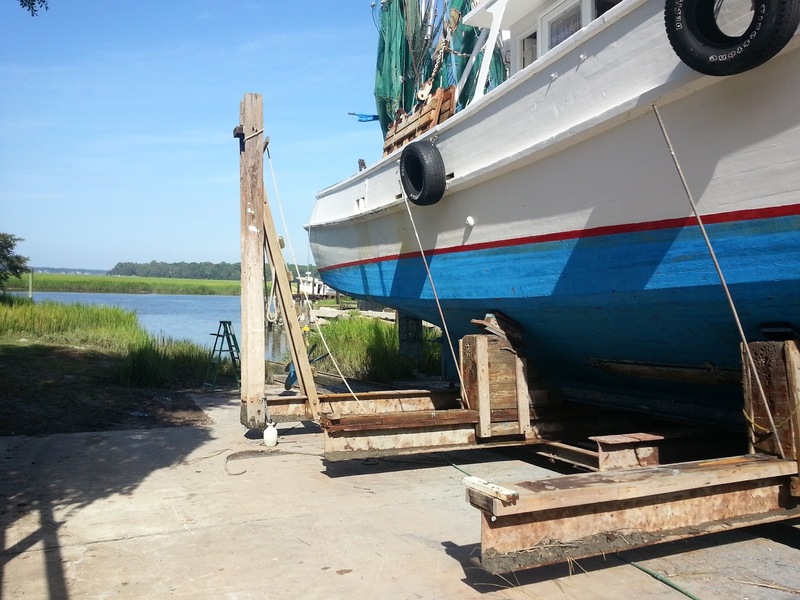 Miss Pollyanna was brought down from Beaufort, SC in a high sea for the purpose of general maintenance up on the rails. Marine railways became favored over a traditional dry dock in the early 19th century and are now on the decline due to environmental issues. 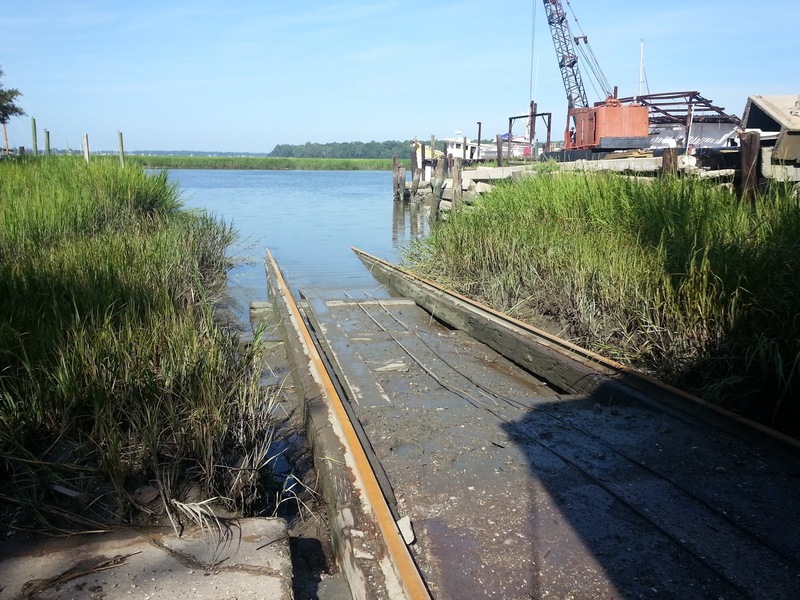 The rails extend into the water and run at an incline for a couple hundred feet. On a high tide, Miss Pollyanna floated into the cradle and was drawn up the railway by a winch . The winches hauled her up the rails to hover a foot or so off the ground so Bobby, Bernie and Pee Wee could scrape off the barnacles. When I arrived, they were power washing her down so they could paint. I averted my eyes. It didn’t seem right to be all up in her business. Miss Pollyanna stood proud, but there’s only so much a girl can stand. There's a handful of marine railways still in operation, most of which claim to be the oldest operational marine railway in the country or something equally grand. The original ones used horses to pull the boat, then steam engines. This engine (2 photos above) is I-Don't-Know-What. It. 's a beast. If you know how it runs, leave a comment. Isn't this stuff great??! I love it when I discover new very old stuff.